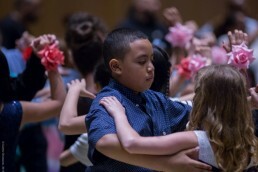 Dancing Classrooms is an in-school social and emotional learning program that cultivates essential life skills in fifth and eighth grade children though the practice of ballroom dance. 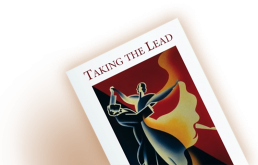 The Dancing Classrooms program transforms girls and boys into mature, self-reliant, and elegant young ladies and gentlemen during its 10-week residencies. With core values of respect, compassion and creating a safe space, Dancing Classrooms Teaching Artists create environments and model behaviors that offer children a place to thrive during their school day. Principals, teachers and parents have praised our program for developing important skills and behaviors in their students, including civility, respect, teamwork and self-discipline. Carefully and systematically selected and trained in the Dulaine Method and the Dancing Classroom Curriculum, our Teaching Artists work very closely with classroom teachers in creating curriculum connection assignments to support their academic goals. In addition to work that supports academic content areas, students write reflections that give the children a voice about how they feel about learning to dance, working with their classmates, and other SEL-based experiences. The core Dancing Classrooms program is a 10-week, in-school residency for 5th, 7th, and 8th graders, and some spring semester 4th graders. With two sessions every week, each residency includes a video lesson and a guest artist visit, and culminates in a showcase for all participating classes, where every child performs. These culminating events are the highlight of our residencies. The school community and parents get to celebrate the social development of their students and enjoy an elegant dance performance as well! Time and again, parents are amazed and touched by the changes they see in their children because of Dancing Classrooms. We work with 5th & 8th grade students, however, exceptions have been made for Spring semester 4th grade students. No pre-requisites or previous dance experience needed. All children are included; lessons are taught in English. Teachers are encouraged to participate.